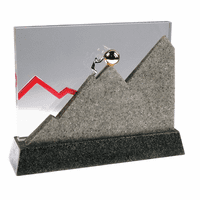 FEATURES/SPECS An ideal addition to any desk top, this personalized inspiration desk sculpture depicts a nickel figurine scaling new heights on mountain peaks made of crystal. 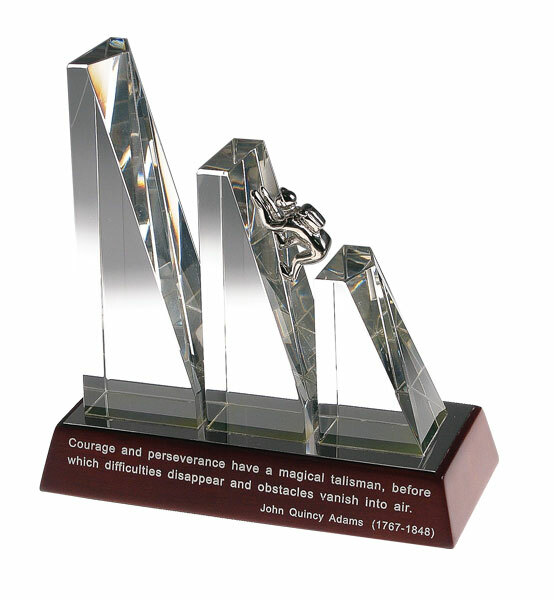 It has a mahogany finish wood base with an inspirational quote from John Quincy Adams: "Courage and perseverance have a magical talisman, before which difficulties disappear and obstacles vanish into thin air." A felt bottom protects your desktop. Add a customized, laser engraved plate to the back of the wood base free of charge, just check the Personalize It box above. This personalized Courage & Perseverance inspirational desk sculpture comes packaged in a gift box, ready to give. 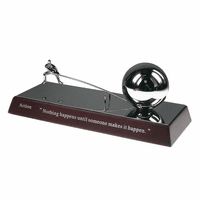 Dimensions: 5 1/4" x 2 1/2" x 5 1/4"
When engraving, where does the engraving go? 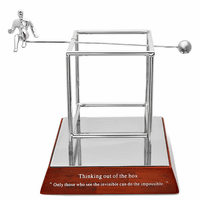 Does it replace the inspirational saying? Th engraving goes on the back of the base. It is done on a silver plate with black writing, mounted on the wood base on the back. Is it possible that with personalization we could include our logo? Sure, you can email us your logo in black and white adobe illustrator .eps format if you have it. If not, a black and white jpeg should work. We'll email you back with a quote. Please let us know if you have any questions at all. This was beautiful but a lot smaller than anticipated. For the amount of money I would have thought it would have been a little larger. Next time I will pay attention to the measurements. The gift far exceeded our expectations! Really great item my teacher loved! It's a perfect gift - my teacher loved it and between me and a friend doesn't cost too much at all! Also very good about UK shipping! 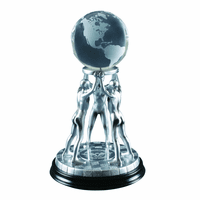 THIS ITEM MET OUR NEEDS FOR THE GIFT WE WANTED AND FOR THE INDIVIDUALS ACCOMPLISHMENTS.